SPECIAL PRICING: Inquire about last minute reservations for savings up to 40%. During the four weeks prior to any arrival date, I will discount the rate on my unit an additional 10% each week for a stay of 7 nights or more. That's 10% if booked 4 weeks in advance, 20% if booked 3 weeks in advance, 30% - 2 weeks in advance and 40% - 1 week in advance. LOCATION, LOCATION, LOCATION are said to be the three most important considerations in identifying desirable real estate. 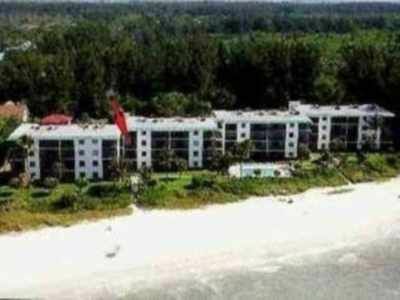 On Sanibel Island this can be further defined to VIEWS, VIEWS and more VIEWS in selecting your vacation home. At our unit 3A3 at Ocean's Reach Resort, we think we have a combination of location and view that can't be beat. Our unit is only 25 feet from the beach, an amenity hard to find anywhere on the Island. Located almost exactly on the elbow of the Island, the views from the beach offer both inspiring morning sunrises and spectacular evening sunsets. With limited development on both sides, the atmosphere of tropical remoteness and serenity is enhanced. With 1000 SF of living space, the unit comfortably accommodates up to 6 people. The screened lanai overlooks the short walkway to the beach and the Gulf. There are many amenities, typically found only in premier properties. These include being professionally decorated and furnished throughout, with solid surface kitchen and bath counter tops, 42” TV and DVD player in the living room and 25” TVs in each bedroom, ceiling fans in all rooms and the lanai and reliable, Wifi internet access. We make personal and family use of the condo 6-8 weeks each year. As such, we furnish, decorate and equip the unit to the standards required to make it a comfortable second home. The kitchen is fully equipped with modern appliances. You will also find an ample supply of dishes, cookware, utensils, dishtowels and other kitchenware to meet all your needs. The dining room comfortably seats six and opens to the living room, the lanai and the spectacular ocean view. The master bedroom has a king bed and there are twin beds in the second bedroom and there is a sleep sofa in the living room. All linens and bath towels are provided and there is a washer and dryer in the unit. We try to include as many staples as possible so you don’t have to run to the store as soon as you arrive and don’t have to buy a month’s supply of something for a one-week stay. These include items like soap, toilet paper, dish and laundry detergent, paper towels and much more. The complex has 64 units in 4 buildings, located on a quiet, secluded dead end street. Its midpoint location on the Island makes for a short drive to Periwinkle and the center of Island shopping. Exterior amenities include tennis/pickle ball court, heated swimming pool, gas grills and picnic area, shuffleboard, basketball court, corn hole, croquet, covered parking, beach chairs, shell cleaning station and other beach games and toys. We also have four adult bikes, available at no additional charge. The beach is famous for the variety of shells that are found and the surf is generally gentle and slopes gradually, making for a great swim area, especially for small children. With limited development on both sides, the atmosphere of tropical remoteness and serenity is enhanced. If you have never been to Sanibel, we believe you will find it to be a uniquely tropical vacation destination. If you are a returning visitor, we invite you to consider our Sanibel home for your vacation. In either case, we believe you will be very happy with your choice. Without question, the greatest attraction of Sanibel is its beach. While other beaches may have better or more sand, higher dunes or other favored characteristics, there is something about the total tropical experience of walking the beach at Sanibel. The combination of magnificent views and a shoreline that brings a new population of shells with every tide is rivaled only by the grace and beauty of the pelicans and gulls in the sky. The dolphins playing in the surf produce a serenity and solitude that is unmatched anywhere. If outdoor sports are your priority, enjoy the three island golf courses and several championship courses nearby. Tennis courts are available at no charge and there are miles of bike paths on Sanibel on which you can explore the Island on the four bicycles provided at no charge. For the nature lover there is the Ding Darling Wildlife Sanctuary offering rare sightings of tropical birds, alligators and other wildlife. There is also The Bailey Track, Tarpon Bay which has nature trails, mangrove canoe trails and other interesting exhibits and many other preserve lands. We make personal and family use of the condo 6-8 weeks each year. As such, we furnish, decorate and equip the unit to the standards required to make it a comfortable second home. The kitchen is fully equipped with modern appliances. You will also find an ample supply of dishes, cookware, utensils, dishtowels and other kitchenware to meet all your needs. The dining room comfortably seats six and opens to the living room, the lanai and the spectacular ocean view. The master bedroom has a king bed and there are twin beds in the second bedroom and there is a sleep sofa in the livingroom. All linens and towels are provided and there is a washer and dryer in the unit. We try to include as many staples as possible so you don’t have to run to the store as soon as you arrive and don’t have to buy a month’s supply of something for a one-week stay. These include items like soap, toilet paper, dish and laundry detergent, paper towels and much more. PERFECT!! Honestly couldn’t ask for anything more!!!! Condo was clean, beautiful, nicely furnished and roomy for our family of four. We arrived late (after midnight) due to flight delays but “check in” was super easy. Loved our view and easy access to beach. We found so many beautiful shells which was great fun. Ocean water was not as clear or blue as we expected due to red tide. Condo was convenient to Jerry’s grocery store, good restaurants, etc. Our 2BR/2BA gulf front unit is only 25 feet from the beach, an amenity hard to find anywhere on the Island. Located almost exactly on the elbow of Sanibel, the views offer both inspiring morning sunrises and spectacular evening sunsets. The beach is famous for the variety of shells that are found and the surf is generally gentle and slopes gradually, making for a great swim area, especially for small children. With limited development on both sides, the atmosphere of tropical remoteness and serenity is enhanced. With 1000 SF of living space, the unit comfortably accommodates up to 6 people. The screened lanai overlooks the short walkway to the beach and the Gulf. The complex has 64 units in 4 buildings, located on a quiet secluded dead end street. Its midpoint location on the Island makes for a short drive to Periwinkle and the center of Island shopping. Exterior amenities include tennis courts, heated swimming pool, grills, shuffleboard, basketball court, covered parking. $1095-$2875/week SPECIAL PRICING: Inquire about last minute reservations for savings up to 40%. During the four weeks prior to any arrival date, I will discount an additional 10% each week. That's 10% if booked 4 weeks in advance, 20% if booked 3 weeks in advance, 30% - 2 weeks in advance and 40% - 1 week in advance.